Have you ever lost money investing in stocks? Or felt that there is so much information about stocks you're looking at, that it's hard for you to make good investment decisions? If so, you came to the right place. So many individual investors are frustrated with stock research, which takes too long, and the information they get is often imperfect or incomplete. But there are some effective, easy-to-use tools that can help you with your stock research, that we're going to show you this later in this piece. Stock investing is a hard discipline. Numbers show that the majority of individual investors, who aren't investment professionals, lose money every year. There are a lot of reasons for this outcome, but the one thing that is clear is that people with careers outside of financial advisement and investment management don't have sufficient time to research a large number of stocks, and they often lack good tools or insightful colleagues who can help them with this paramount challenge. Even if you have a lot of experience investing on your own, choosing the right stocks can sometimes be intimidating. We all tend to fall in love with certain stocks, and forget about investment discipline before putting our money to work. It can be difficult to determine what type of stocks you should look for, or what facts you should understand about your traget stock investments so you're not throwing away your money blindly. With that in mind, here are 7 things stock investors should keep in mind while getting ready to buy a stock they have grown to like. Do you know how much revenue the company you’d like to invest in makes, and what are its revenue growth and profit margin? If not, here is a quick way you can find this out, without having to look up the income statement. 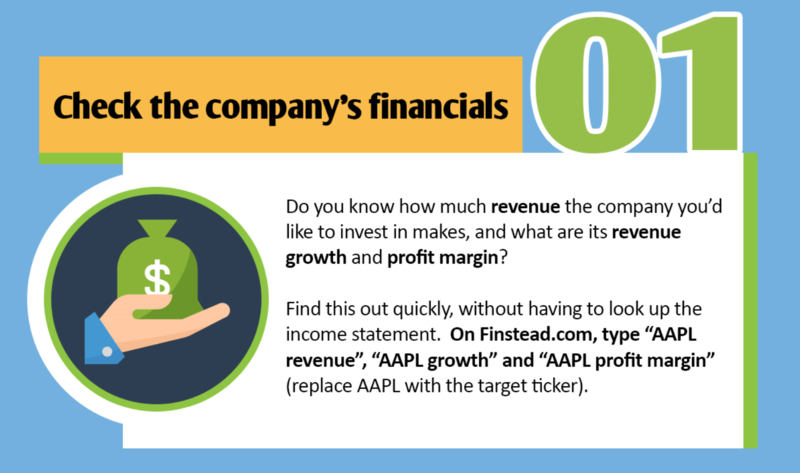 On Finstead.com, type “AAPL revenue”, “AAPL growth” or “AAPL profit margin” to get your answers quickly (don’t forget to replace AAPL with the ticker of the company you’re researching). Do you know how the company you’d like to invest in compares to other potential investments, i.e., other companies? You can compare any two companies on Finstead.com. 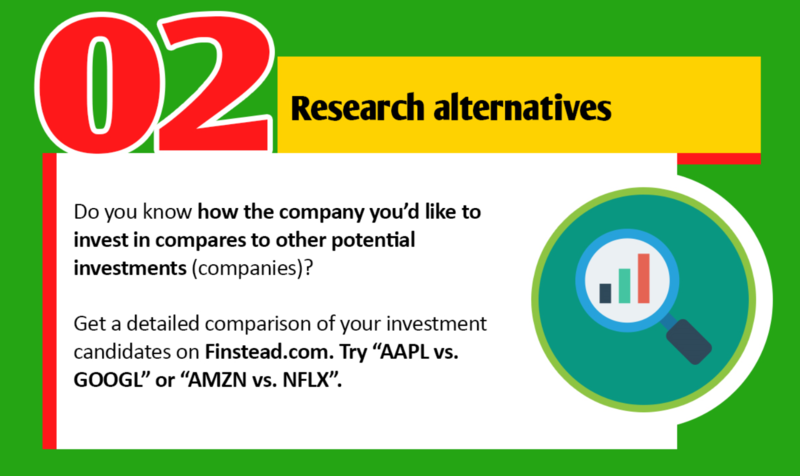 Try “AAPL vs. GOOGL”, or “AMZN vs. NFLX” to get a detailed comparison of your investment candidates. What do the bulls and bears say about the stock? 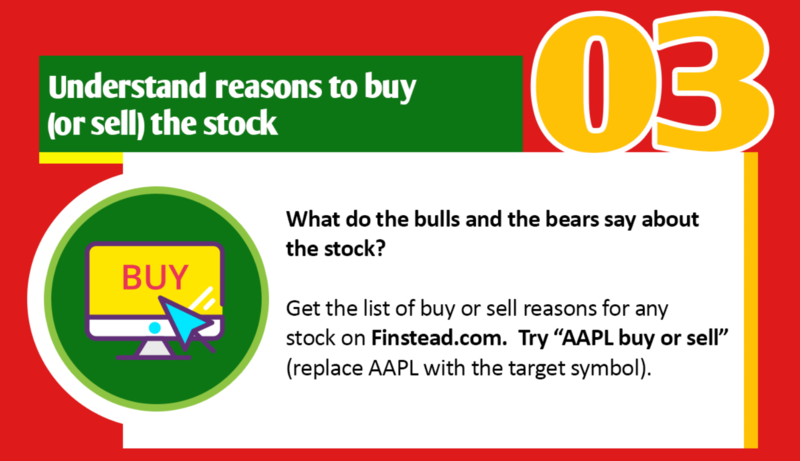 Get the list of buy or sell reasons for any stock on Finstead.com. Try “AAPL buy or sell” to get a detailed analysis for Apple. Replace AAPL with the target symbol to get the scoop on the stock you’re researching. 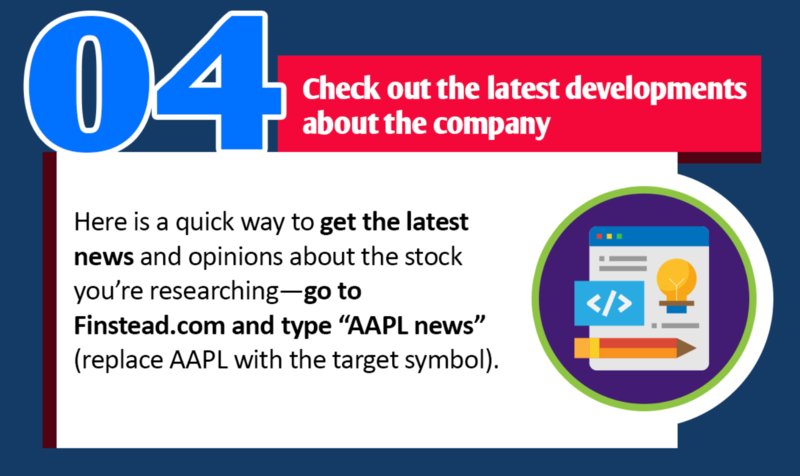 Here is a quick way to get the latest news and opinions about the stock you’re researching—go to Finstead and type “AAPL news” (replace AAPL with your target symbol). 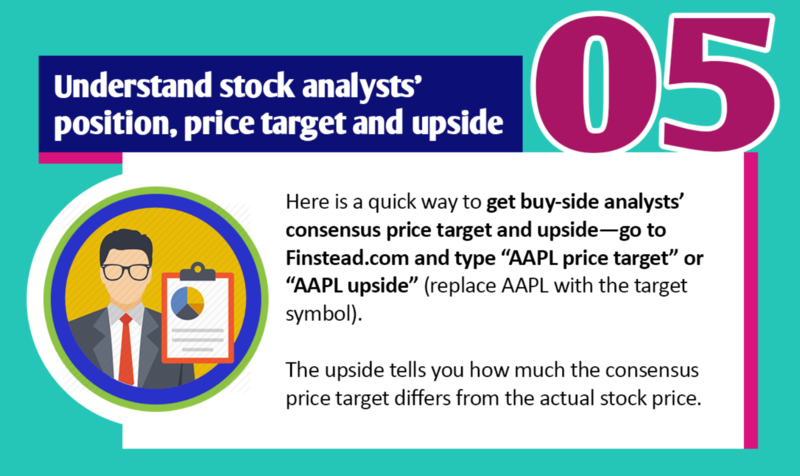 Here is a quick way to get buy-side analysts’ consensus price target and upside—go to Finstead and type “AAPL price target” or “AAPL upside” (replace AAPL with the symbol of the company you’re researching). The upside tells you how much the consensus price target differs from the actual stock price. What is the dividend payout rate, and how does it compare to the stock price? 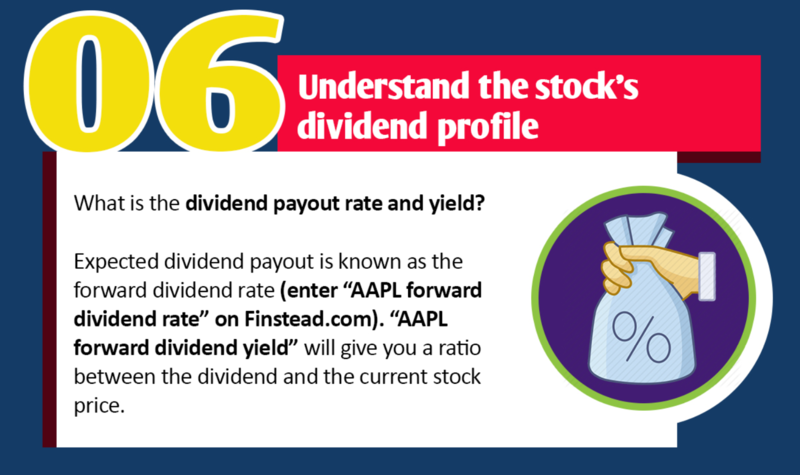 Expected dividend payout is known as the forward dividend rate (enter “AAPL forward dividend rate” on Finstead). “AAPL forward dividend yield” will give you the ratio between the dividend and the current stock price. 7. Is there a lot of short-seller interest? A higher number of short sellers is not always a bad thing—it just means that the stock is likely more volatile than the market overall since some investors are 'betting' against it (check out Tesla as an example example). So be ready for wild swings. 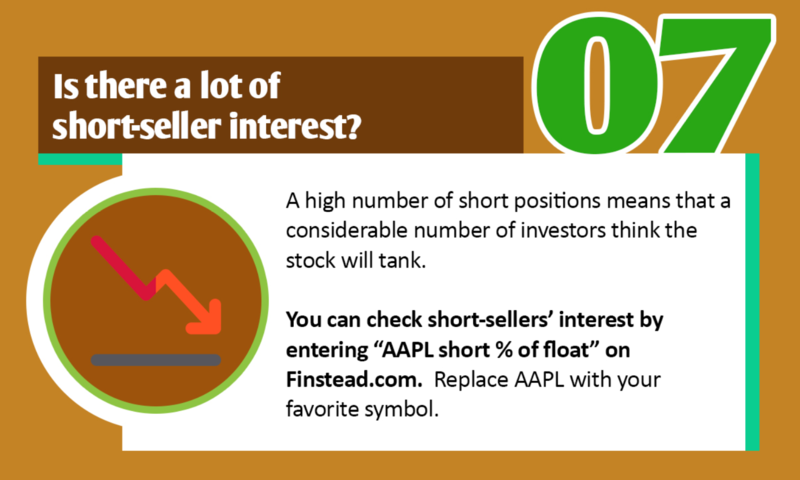 You can check short-sellers’ interest by entering “AAPL short % of float” on Finstead. Replace AAPL with your favorite symbol. Company profile or background (e.g., try “AAPL background”). Below is a complete infographic for stock investment must-dos.